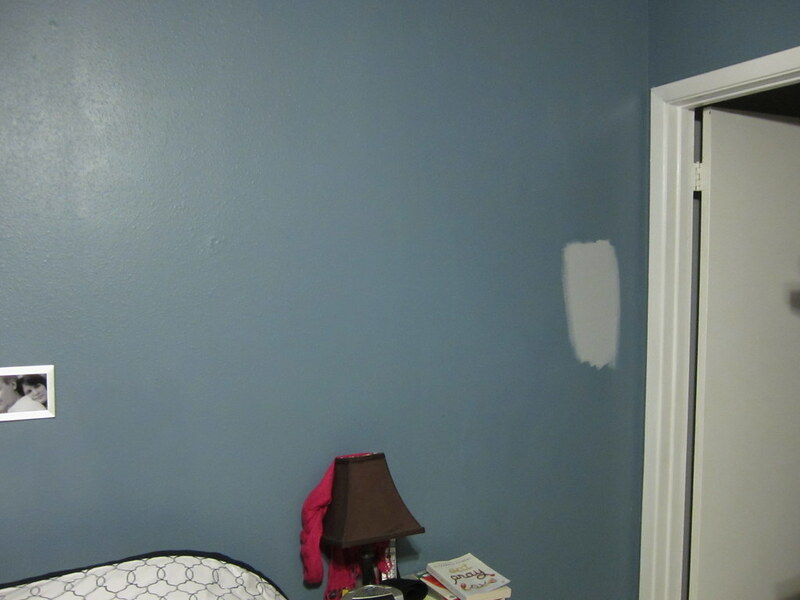 The Adventures of Faith: To Paint or Not to Paint? 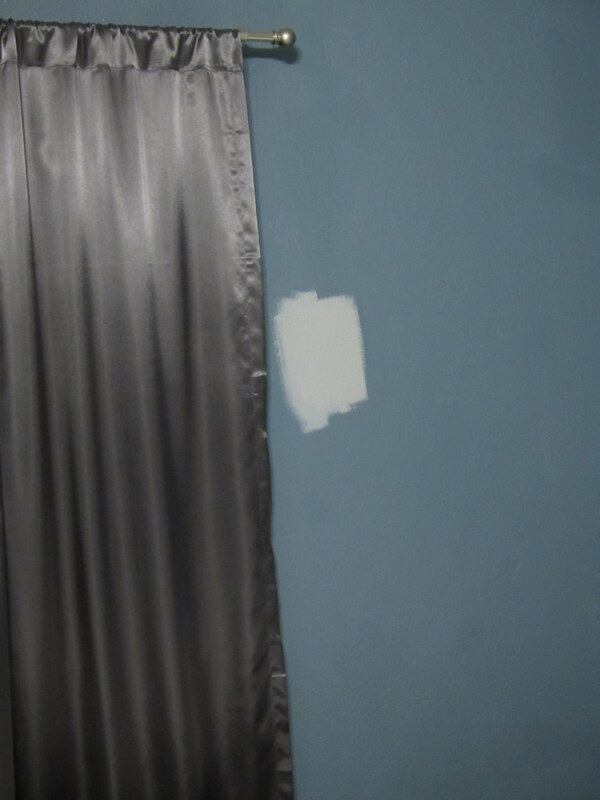 I painted our master bath this great blue grey color. John was a little apprehensive at first thinking it would turn out to look like a battle ship, but really likes how it turned out. I love the color so much I'm really thinking of painting our master bedroom the same color. I couldn't get a great picture of the true blue, but got the best that I could. The two pictures above are the ones closest to the actual color. The others turned out much more gray than the paint is. 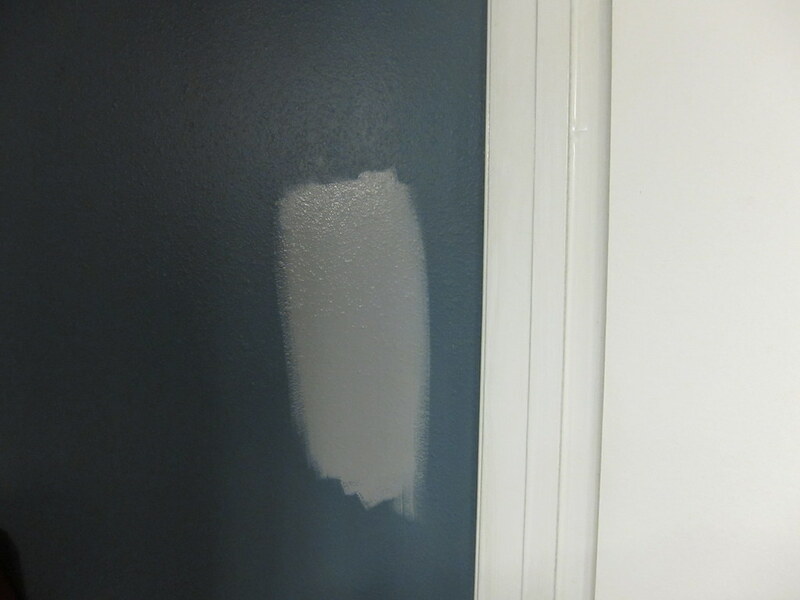 I painted a couple of samples around the room to see if I'd like it. I do and I don't I love the color, but wonder if it would be too bright. We were worried that the original color would be too dark, but it really isn't. I kind of like the darker color because it's relaxing, but wonder if the new one would be a bit more refreshing. Any thoughts? I like the color that's there now. Don't change it is my vote! 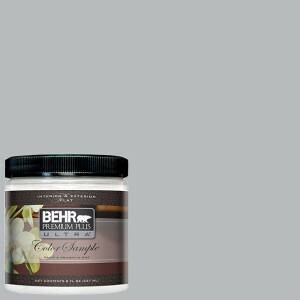 We have almost that same Behr color all over our living room. Justin was also apprehensive, but we love it now. It's a nice neutral that doesn't feel like your typical neutral. We warmed it up with dark browns and greens, which is similar to the palate you have going on in the bedroom. 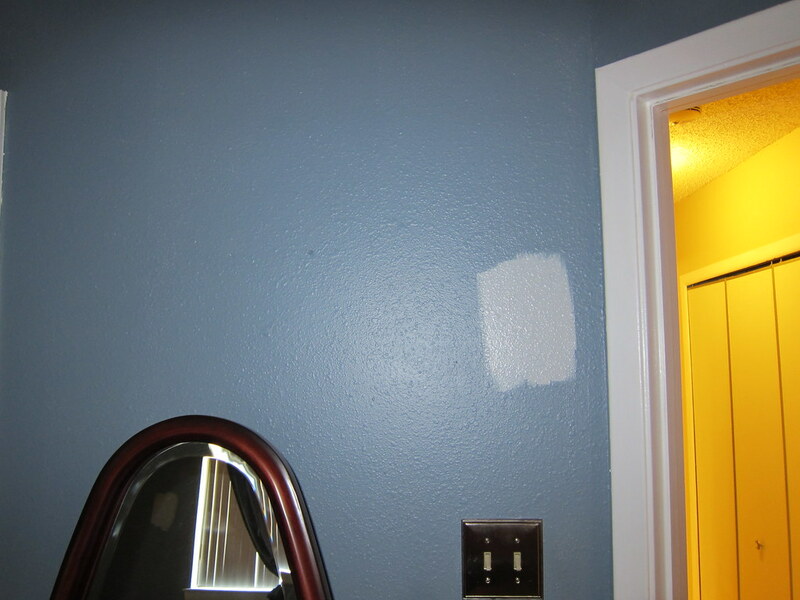 I vote that you paint a wall in the bedroom, see how you like it, and go from there. I think it's pretty and it would lighten the room. But it also looks like your bedspread is pretty light and I like the dark paint better with your bed. hmm, it's a tough call. I generally like the darker colors in the bedroom because I too find it soothing but that gray could look really nice too! Were you thinking of adding any accent colors to the gray in the form of curtains/duvet cover, pillows, lampshades or art or did you want to keep everything the same and just change the wall color? I do have a few grey accents in the room currently. It's mostly dark brown wood, silver and grey accents and then the duvet is navy and ivory. The only thing we will be adding to the room is a head board which will probably also be dark wood. 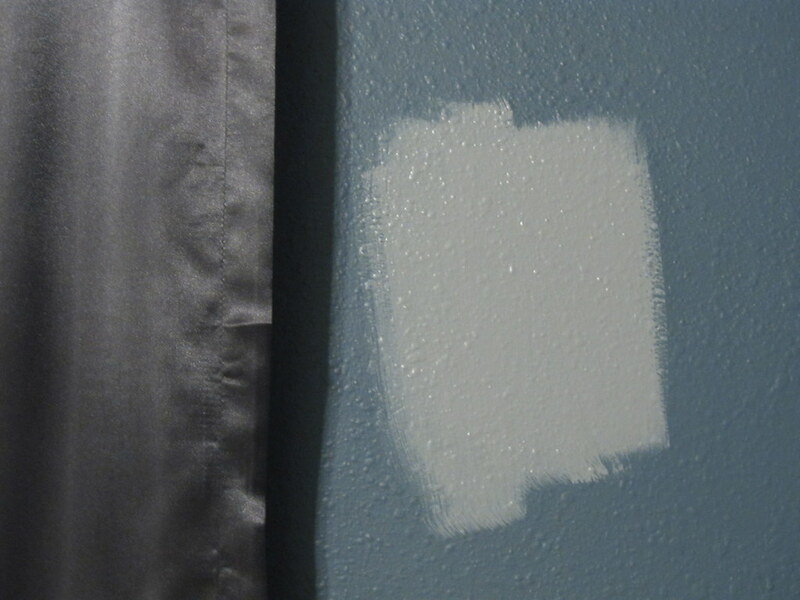 I may try painting a wall and seeing if I like it. It's a little hard to tell with random splotches. Thanks for that tip Meredith! I really like the currant color, but like you guys said, it's too hard to tell what the grey would look like. 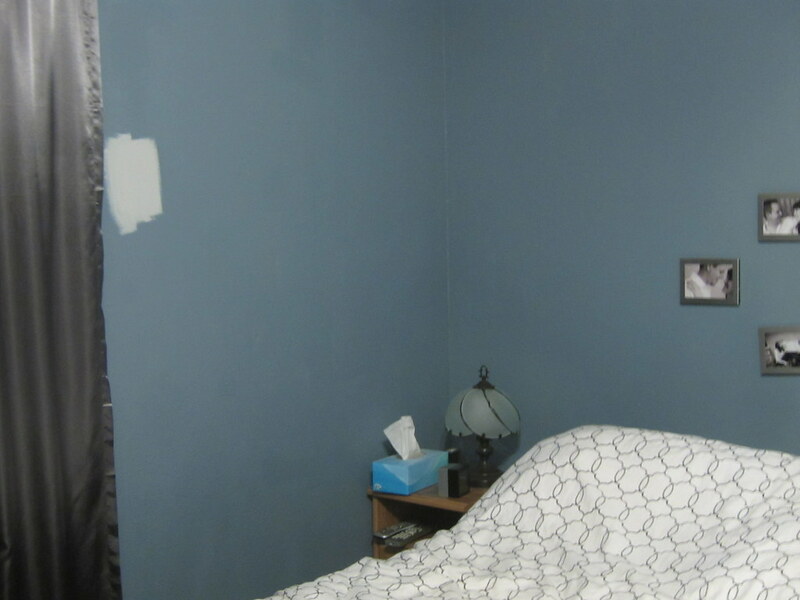 Maybe paint a larger spot behind the bed or some furniture so you can see how it contrasts? 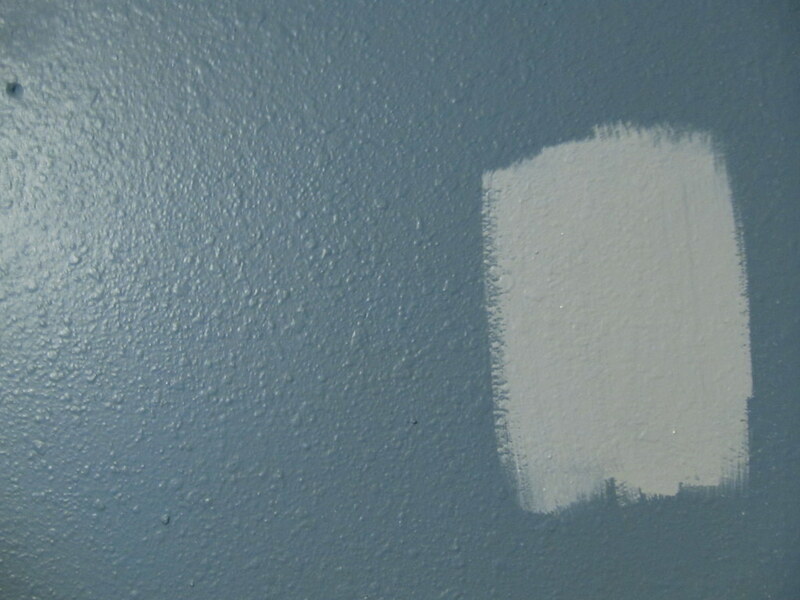 I really liked the grey in the paint swatch, but it loses its color when it's with that blue. Errr...just re-read the post....I want to use the color in your bedroom for our bath...lol...I need to go to bed!